Finding the right soap for sensitive skin may be the best gift ever for a woman past her teen years. As a teenager, pimples are forgivable and expected, but beyond your 20’s, when you still can’t get rid of them, they become absolutely your worst nightmare! So really, what can we do? How many cosmetic fads, expensive facials and daily prayers to our beauty Gods do we have to go through to find THE one? The answer to this is simple: stick to au naturel. Thanks to fresh alternatives like the Moringa-O² soap, we now have healthier options to use in our beauty regimen. The Moringa-O² soap not only gives you the benefits of the moringa oleifera plant, but it also combines the vitamin powerhouse of olive oil and omega (sunflower) oil. With all these honest to goodness natural ingredients, you can be assured of a healthy, radiant and glowing skin. 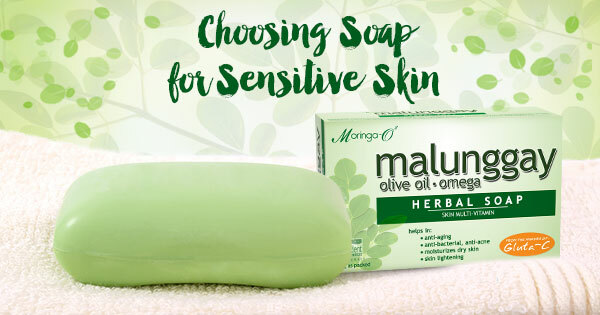 The Moringa-O² Herbal Soap is a great soap for sensitive skin. Rich in anti-oxidants that act against free radicals, detoxifying our skin and protecting it against everyday pollution and smog. Stimulates the production of collagen for a youthful glow. Source for Beta-Carotene which is protection against sun damage and also aids against premature skin aging. Moringa-O² is the first and only product combining all three powerful natural ingredients into one soap. Imagine all these benefits in just one product at a very reasonable price! We can now stop fearing those dreadful breakouts and dullness from using harsh, chemically infused “skin care” products. This healthy alternative is the best treatment you can give to your skin and that is what your skin deserves especially if you have sensitive skin. Check our products page for the complete Moringa-O² Skin Care Line.